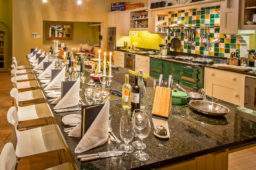 Relax and let Chef serve, as he prepares a gourmet menu for you and your guests, passed at the kitchen counter. With a wealth of experience, Chef brings cooking to life with an array of skills and anecdotes that will fulfill anyone with a love for food. Includes a glass of fizz on arrival followed by a 5 course meal with extra’s.